It’s a beautiful, sunny day here in Ohio. We have clear blue skies and cool temps (only about 42 degrees Farenheit today). I’m still thinking about the Project 365 photo project that I started last January. There’s nothing wrong with adding a few more images to the blog this year. I am making plans for next year and I hope to scale back to a photo a week instead of trying for a photo every day. Today’s photo is of one of the little Christmas ornaments that we put up each year. My wife likes to go all out with Christmas decorations. We put up 6 Christmas trees in our house. Only 2 of them are really big, the others are smaller and some don’t have any decorations on them ( or come predecorated). My wife and son believe that you can’t have too many lights on a tree (and that you should be able to read a book by the lights on the tree. My daughter and I are more minimalist in our lighting expectations. Less is more, so to speak. We also put up various decorations in the rooms of our house. This image came from one of the little tree decorations that we have. I thought that it was a nice symbol of the season we are entering. I shot this one with my 50mm f/1.8 lens. It’s a really nice lens for short depth of field and tight focus. Happy Holidays to all. 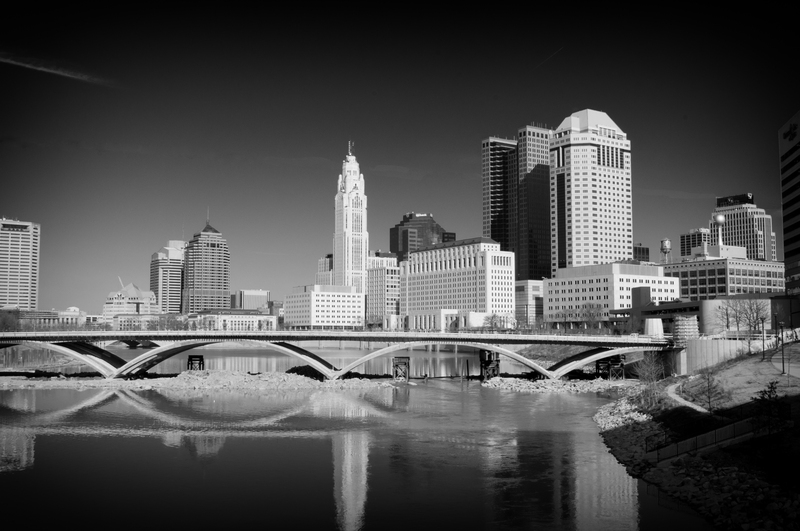 Today’s image comes from the Scioto Mile, a new park area in downtown Columbus, Ohio. I’ve taken a photo of this scene a few years ago, but didn’t like how it turned out, so I went back today to try to get a better shot. I think this one came out best. The color version is really good, but I love black and white images and I love how this one turned out. There is a lot of construction going on in downtown Columbus. The third of three bridges across the Scioto River is nearly complete and the view when complete will be very pretty. The central park area of the Scioto Mile is also really well done. There’s a band shell and green space to listen to outdoor concerts, a water play area for children with some really cool metal sculptures, and the Milestone 229 Restaurant. I didn’t go in, but there were lots of people there getting brunch. Note to self: must try brunch there sometime!